Here at StoryToys we were lucky enough to wish Eric Carle Happy Birthday as he tried out our brand new app, The Very Hungry Caterpillar™ – Creative Play, released in honor of his 87th birthday, and to ask him a few questions. StoryToys: The caterpillar apps are used by over 1.5 million children. 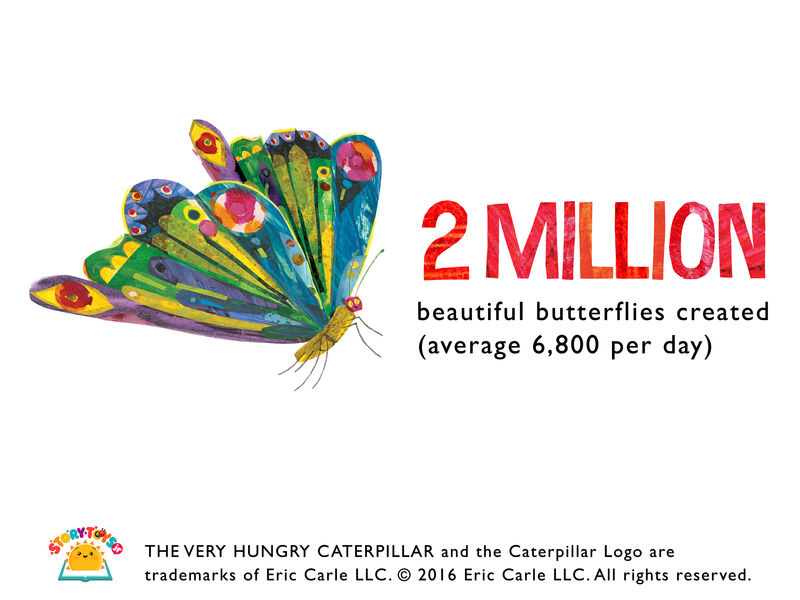 In My Very Hungry Caterpillar alone, they have eaten half a billion pieces of fruit in the app, spent 18 years painting, and created over 2 million butterflies. How does it feel to see your creations and much-loved characters now thriving in the digital world and continuing to influence a new generation in new ways? 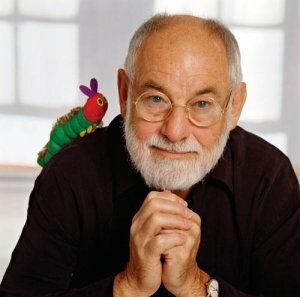 Eric Carle: I still consider myself a beginner at learning how to use the computer – but I can see how technology and the development of apps, ebooks and computers are a part of the evolution of our world. It has been this way since the very beginning. Cave men once wrote stories in pictures on stone; later the book was invented and so on and so forth. So change is inevitable. And I am very pleased that my work is being enjoyed. I million butterflies, how beautiful! ST: Your vision, aesthetic values and artistic techniques have consistently captured the imagination of children and adults alike worldwide since your very first publication. Now, approaching your 87th birthday, how does it feel to know that your unique vision has such an enduring and extensive influence? EC: Well, it’s a great honor to know that my book has been read by generations of readers and families. It really is moving to receive emails and letters from parents who were raised with my books and who are now reading them to their own children. I think what was meaningful to a person as a child, to be able to share that with your own children, it’s quite powerful. ST: The VHC was first published 47 years ago. What do you think your 40 year old self would make of apps like The VHC Creative Play, and the possibilities they afford children to encourage artistic expression? EC: That is a very good question. I think in my 40’s I may have been more of a purist when it comes to my own work. I love books, the feel of the paper, the weight of a book in my hands. But now I can see how the whole world has changed with the advent of computers. There is so much design work now being done on computers, for example. ST: Your design background always comes through in your “deceptively simple” yet very sophisticated images. How do you find the digital experience? Do you feel it’s something you would have enjoyed as a child? EC:I think for my work I still enjoy so much the sensation of a paintbrush or a pencil on paper and the tactile experience of painting and cutting my tissue papers to make my illustrations. As a child I loved to draw and be in nature, take walks with my father. I can’t say what my life would have been like to have grown up now. I can say that for me the bright colors in my work have been a kind of antidote to the grays and browns of my childhood years during the Second World War. And I hope my books, in the various forms in which they are now available, in books, on computers, on the stage, I hope that the colors are a source of comfort and hope in the way they have been for me over the years. ST: Your books have a strong educational theme and encourage a love of nature. The apps based on your books also stress these themes, and encourage children to embrace a gentler pace. Do you have any concerns about children these days connecting to nature in such a fast paced and busy world? EC: I don’t think about themes when I am making my books. I am not trying to convey a certain message. But my love of nature is always there because it is a part of me, a part of what I grew up learning about and appreciating. I hope we will take care of creatures and the oceans and the land. It is so important to expose children the beauty of art, literature, theatre, dance, music, poetry which all ennoble humankind. I think connecting to nature and to all of the arts are so important for all people, but especially to children.